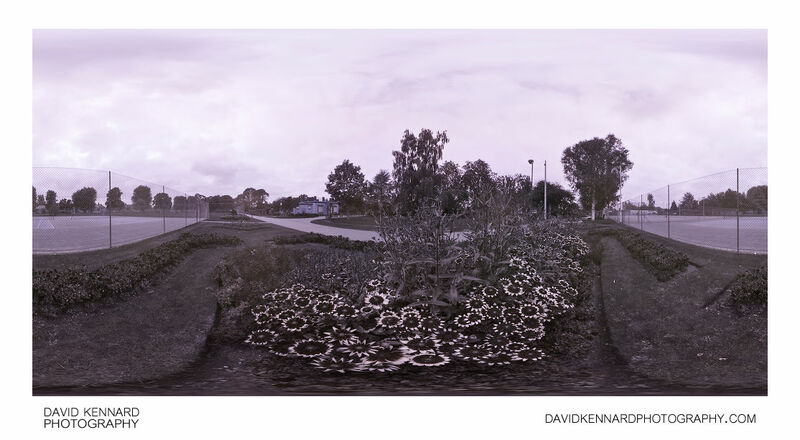 Ultraviolet panorama by the flower beds near the tennis courts in Welland Park, Market Harborough, UK. In ultraviolet, flowers can have quite a different appearance compared to how they look in visible light. The Rudbeckia flowers in this image have a dark area around the centre of the flower, something that is not visible to humans. This kind of pattern is visible on many different species of flower, and is often referred to as a 'nectar guide'. Bees and other insects can see UV light, and it is thought the dark marking around the centre of the flower helps the insects find the centre of the flower (where the nectar and pollen are located).